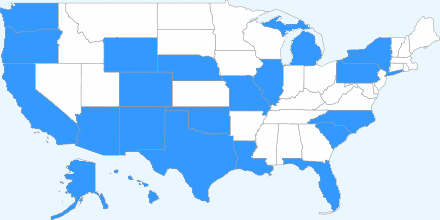 I was so curious to see how this mapping worked that I gave it a try already a few days ago, but I was impatient about waiting for the DNS to populate, so I had actually deleted the subdomain I had created and removed the 3rd party set-up from the blog. I was just too busy during the week to keep an eye on this to make sure the DNS did populate eventually. Since I did not wait for the DNS to populate, I was not 100% sure whether it worked or not, but I figured I would wait for the three-day weekend so that I could afford to be patient. Imagine my surprise when I found out that the multi-step verification process I went through did not have to be repeated and apparently the DNS procedure went through just fine, so that I did not have to do hardly anything when I went to map today. Supremely cool! Adam, I don't think the tutorial says that people only have to do all that tedious stuff ONCE, and then they can apparently map all the Blogger blogs they want in no time at all. It might be good to indicate that! I would have been happy knowing that by doing the mapping once, I was getting ready to be able to instantly map all the Blogger blogs that I want. So, here's what I did today - I thought I would be here for an hour, but it took just a few minutes! Then, I followed the steps in this tutorial for the actual mapping. 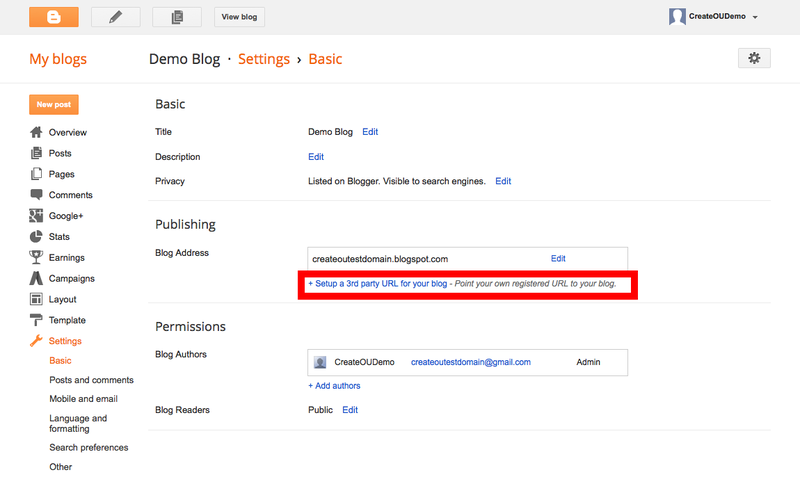 I put in the CNAME ghs.google.com (Step 5), and then when I went to enter the 3rd part address at Blogger, I did not get the error message about verification! I was surprised, but sure enough — there was no error because I was already verified. GLORY HALLELUJAH. I had no idea I would get to skip all those steps: what a nice surprise! I don't really feel a need one way or the other to map all my Blogger blogs, but this is a very cool opportunity for my future students. If they are already using Domains because of a previous class they were in, I feel confident that I can help them to map their Blogger domain, while also giving them good support on the use of Blogger itself. Of course, if they are WordPress users and want to carry on using WordPress, that's great: my only requirement is that their blogging platform support full RSS and also labels (tags, categories, whatever) for navigation. I feel proud of myself, and it was good to go through a process like this and learn something new - that sense of nervousness but also the excitement when something succeeds! I ask my students to do new things with technology, so it's good to remind myself of just what that feels like. To me, it feels good!!! THANK YOU, Adam, for the chance to do this! Much appreciated. LMS Futures: Extinction? - Michael Berman's final post in a great series on LMS futures. Book Advocates 'Reacting to the Past' Pedagogy - I am a big RTTP fan after having attended one of their workshops last year! I hope this book by Mark Carnes will increase the success of this already very successful and incredibly innovative program, and I was very happy that it got a write-up in Inside Higher Ed. Building a Professional Development Hub for your School - This is the first of a series of posts at Langwitches about online professional development, and this first post reviews the big advantages of going online. Using Pinterest for a More Visual Professional Development - I was glad to see this from the guys at Fractus Learning; I am more and more a fan of Pinterest! What The Tweet? Your Illustrated Guide To New Twitter Jargon - A really great Twitter guide from ReadWriteWeb and, yes, I have a dedicated class Twitter feed as of this semester. It's fun and useful too! Confessions of an Outlier in the Aftershock of Ferguson - Paul Thomas's very timely piece which also raises some timeless issues in education. 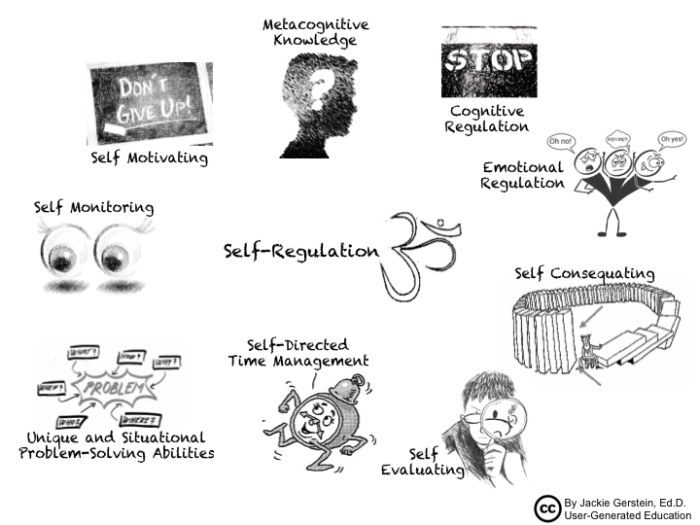 Self-Regulation: The Other 21st Century Skill - Jackie Gerstein's compendium of self-regulation resources, with a wonderful Gerstein graphic as always; I've included the graphic below. Recent Research Review -- Reviewed (and Lamented) - Some great observations here by Will Thalheimer, especially on the importance of practice and feedback in learning. Designing for Emergence: The Role of the Instructor in Student-Centered Learning - And, last but definitely not least: this is the article I would nominate as the best article I read this week, from Mary Stewart over at Hybrid Pedagogy. Fall Diary, August 27: student storytelling! I've just been so busy this week, so here are the relevant Google+ posts for today! I've just been so busy this week, so here is the relevant Google+ posts for today! I've just been so busy this week, so here is the relevant Google+ post for today! 2. 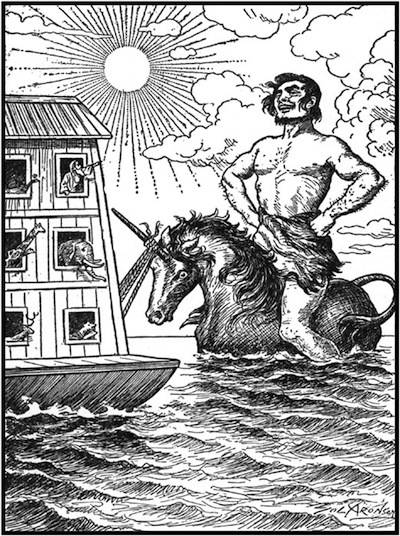 I created a temporary redirect that will send people going to lauragibbs.net to this blog, since I will be keeping a chronicle here (for now anyway) of my Domain adventures. I'll use Domains as the label for these posts. 3. 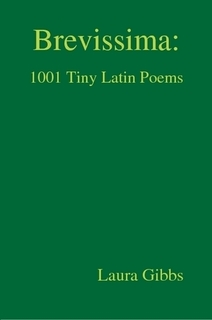 Just for fun, I set up a subdomain, brevissima.lauragibbs.net, which points to the blog for my Brevissima book. It works! This is going to be a great opportunity for me to explore WordPress and my goal is to keep on developing Blogger support for my students (I am esp. encouraged that there is domain mapping, so people could map a Blogger blog to their own domain), while also learning about WordPress so that next year ... if this project continues, as I hope it will! ... I can offer students a choice of WordPress or Blogger. And the next Blogger blog I set up, I will map to this lauragibbs.net domain and learn how that works so that I can document that process for my students. I've been thinking a lot about online presence lately, both instructor presence in an online course and also student presence. And when I start thinking about something a lot, well, I end up with a lot to say. So this will probably be the first in a series of posts on this top. In this post, I'll focus on instructor presence and exactly how I create an online presence for the courses that I teach online. I'll start with this contention: online presence — both instructor presence and student presence — is the single most important element in online course design. I know that is true for my courses... and I would be curious to know what other online instructors think about that! And here's a thought I recently had: the current obsession with talking-head video is an attempt — a badly misguided attempt — to create online presence. Video, of course, is just content, and not even a particularly robust form of content for all kinds of reasons (more on that topic). A talking head video is NOT online presence. So, while I've taken several MOOCs that included video, even abundant video, by the instructor, those videos did nothing to make the instructor seem really present. The latest Janux course I tried, for example, represents the most extreme case of that I have seen so far in the world of MOOCs: apparently the instructor listed for the course is not participating in any way at all, except insofar as they filmed her in some videos — last semester? last year? There's no telling. In any case, the videos are not new, which means they are not responsive to the class right now and not responsive to the students in that class. Because that's what it's really about: online presence offers the responsiveness of a face-to-face encounter, while overcoming the F2F constraints of time and space. Online presence, unlike face-to-face, is asynchronous, persistent, re-usable, linkable, searchable, discoverable, all those Internet virtues... while also being directly responsive to a given class and the needs of the students in that class. When I first started teaching online in 2002, there was only a very limited range of tools for developing online presence. Webpages (freestanding webpages, not blogs or wikis, etc.) were really about the only tool that I had available, but I published a lot of webpages... and my students did too! From the very semester that I taught online, student websites were the heart and soul of the class, and that continues to be true of my classes today. Now, however, there is a whole wide range of tools available for creating an online presence ... more tools than I can even hope to take advantage of. So, for the remainder of this post, I will talk about some of the tools I am using this semester, all of which I am extremely happy with... some new, some old, ALL of them fun to use! Daily Announcements Blog. This is probably the single most important focal point for my course-related web presence. There is a new announcement post every day (I queue them up a day or two in advance), with information about course assignments and activities, along with all kinds of other content just for fun and random discovery. I embed this blog page as the homepage for each of my courses in Desire2Learn, so there is something fresh there every day, no matter what day(s) of the week the students are logging in. Class Twitter Feed. In addition to the daily announcements, throughout the day I am updating the Class Twitter Feed, so not only are there new things every day in the class announcements, there are new things throughout the day in the class Twitter feed. I am able to embed that feed in the Announcements blog, and the Twitter widget is highly responsive: you can tweet me from right there inside the widget. Tagboard. For course-specific content, there are the #OU3043 and #OU4993 hashtags, and this allows students to contribute to the class feed also. Tagboard will be a really handy way to develop that shared hashtag presence: #OU3043 Tagboard and #OU4993 Tagboard. In Week 2 of the class, I am going to see if I can get students interested in trying this! Pinterest Boards. This is my newest experiment. I got hooked on Pinterest last year for my own personal projects, and then I started seeing all kinds of ways in which I could use Pinterest for my classes too. 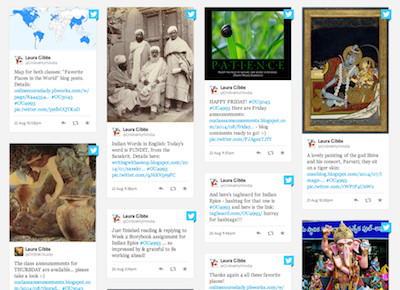 So, the Pinterest Boards are another way that I am creating online presence and, as with Twitter, I am hoping this is something the students will join me in: Myth-Folklore Pinterest Portfolio and Indian Epics Pinterest Portfolio. Now, those are the ways I create online presence related to my classes, which is in addition to the main ways in which I maintain an online presence, which is mostly at Google+ and in my non-class-related blogs, like the long-running Bestiaria. I also have a separate Twitter account, different from the class Twitter: I'm OnlineCrsLady. Of these tools, Pinterest is the one that is the most new to me, so I still getting my "rhythm" with that one, but for the other tools - Announcements and Twitter - they are an automatic part of my daily routine, even more fundamental than email. My guess is that if faculty try to teach online with email and a learning management system as their only tools, they are probably not going to be able to create a highly dynamic and responsive online presence. Limited to email and an LMS, I would not be able to achieve my goals as a teacher online... but with tools like Blogger and Twitter, I believe I can create an online presence that is of greater and deeper value for my students than the ephemeral face-to-face conversation we would have for 150 minutes each week in a classroom. So, those are my thoughts for today about online instructor presence. Next time, I will try to say something about student online presence, and hopefully I will have more to say about my Pinterest adventure too. Meanwhile, I've pasted in below screenshots of the Announcements, Twitter, Tagboard, and Pinterest just to give a quick visual impression of what they are like. They are pretty cool, very attention-getting! Better than video...? I would say so. Fall Diary, August 23: Day 6... such a good first week! Normally I don't do schoolwork on weekends, but I think the UnTextbook marks a real shift in the overlap between my hobbies and my teaching... so here I am, happily do schoolwork (schoolplay?) on Saturday. In the past, I had used my spare time for all my Latin hobbies but now, having finally (!!!) set that aside, working on all the beautiful books in the UnTextbook is now my happy hobby. So, what I did today was to go through all the UnTextbook blog posts from the students last week in order to see what units were most likely to be picked in the coming weeks. Here are the results: UnTextbook Student Picks. I'm not surprised that Ancient Egypt was such a popular choice... it was a popular option in the old version of the course too! I was also really happy that almost every unit got picked by at least someone. I really wasn't sure what to expect about that, but it validates my sense that there is a huge range of student interests out there, and the more we can do to anticipate that range of interests, the better. I was also super-pleased that Jewish Fairy Tales got mentioned by so many students as a possibility, so that is the unit I need to get to work on, adding notes. And what a pleasure that will be! Fall Diary, August 22: Day 5... maps! 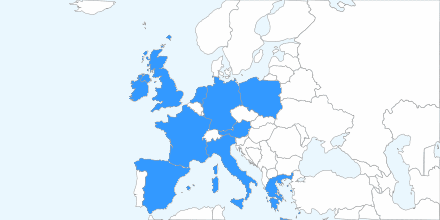 I found some time this evening to go through all the Favorite Places posts and compile them, and then I made maps: the world, Europe, and the U.S. So much fun! I compiled all the post links, and I think I will use this as an extra credit option in the Review Week (Week 8) as an option for some fun social interaction! Then I put the world map in the Saturday announcements too! Today was another day that was especially bureaucratic... I need to remind myself that the Wednesday and Thursday of add/drop week are just crazy-making, and not just for me, but no doubt for the students too! Chasing down students who haven't done Orientation Week assignments, replying to all the students who want to enroll... very distracting. It was hard to find any real time to focus today! Still, the blog groups are set up, and commenting can begin. I hope that will go well! One student ran into a strange snag with his Google account in Chrome (weird!) which interfered with commenting, but things turned out fine when he used Firefox. So, we'll see: I'll definitely be keeping an eye on the email this weekend in case people do run into problems. 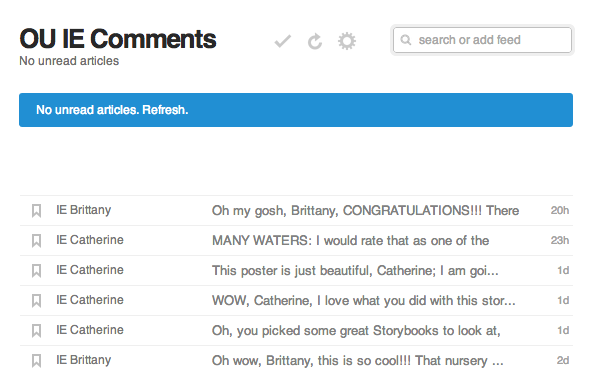 I'll confess that this is the one place where the Blogger solution falls short of Ning: in Ning, the "Comment Wall" and the "reply back" features really made it easy to sustain conversations. I realized too late that I should have had people create a Comment Wall post immediately at their blog, so I will be sure to fix that next semester. It's a logical thing to ask them to do when the Week 4 Internet assignment rolls around, though, so I'll be sure to include it then. Better late than never! And since bureaucracy wears me out like nothing else, that's all I have to say tonight for my course diary... but hoping for good adventures on Friday without all the add/drop distractions that really tugged at me both today and yesterday. Fingers crossed! Fall Diary, August 20: Day 3... tagboards! Today was the bureaucratic day of Orientation Week, boring and not very exciting to write about. I only had a few students to track down who were no-shows, and there were students who dropped (which I anticipate... indeed, I count on it - I overenroll, knowing some will drop... but never knowing just how many), and then I was able to make the Blog Directory. That means I will be able to set up the responding groups on Thursday, and I'm going to be trying to do a better job with that part of the classes this year. Given the chaotic nature of each week — where it's never sure just which students will do the blog posts and likewise which students will do the responding — I've decided not to try any longer to do groups that persist from week to week. Instead, I'll be doing new groups every week, and I should know on Thursday just who has posted a story for the week and who has not. During Orientation Week there will probably be some stragglers, but that's okay - I'll be putting everybody in groups tomorrow, and then, starting in Week 2, I'll be able to see who has published a story (grace period deadline at noon on Thursday), allowing me to base the groups on just who has published a story that week and who has not. So, not the most exciting stuff... but I did manage to set up tagboards for the classes. That was fun! 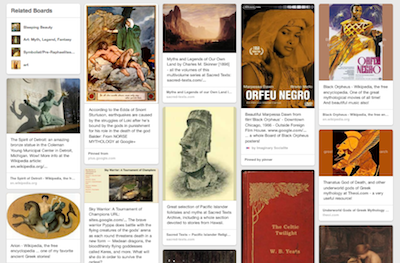 Here's the Myth-Folklore Board, and here's the Indian Epics Board. I think this could be really useful because if students also use the hashtags in their posts, it should all show up together. And tagboard has an embed feature! Let's see how it looks!!! Today was Day 2 of the semester, with three assignments to do: a "Declaration" at Desire2Learn (really a quiz, but I relabel the Quiz tool as "Declarations" since it is the only kind of quiz I use), creating a Blogger blog, and posting a first Blogger post with images. You can see the assignments here: Orientation Week. Since I have about 100 students, it's easy to do a percentage: I'd say that 95% of them had no problems at all. I think that's GREAT, so no complaints here. In fact, it's way better than I expected ... although, since this is my first time using Blogger with students, I wasn't really sure what to expect! Of course, a few students did run into problems, and because the Blogger instructions are being used here for the first time, I was so grateful for their feedback in terms of being able to update the instructions to avoid confusion in the future. Biggest source of confusion: difference between creating a blog and a blog post. I shouldn't be surprised by that; for some years, I've noticed that students often use the word "blog" to refer to a blog post... but I didn't anticipate the way that would be a problem for the assignment instructions. Lesson learned. One student also ran into terrible trouble because she put forward slashes into her blog title, and that was in turn a result of not understanding the difference between a blog and a post (she used today's date as the title of her blog). I think that was the cause of the problem ... to be honest, I'm still not completely sure what went wrong, but she was great about troubleshooting it, and she even added me as an admin temporarily on her blog. So, I'm pretty sure it was the forward slashes that caused the problem. I can say with 100% certainty that it was the weirdest Blogger problem I've ever seen (somehow the CSS would not load fully, with very bizarre consequences for blog display and functionality). But we got through it, and the blog is working just fine now! And I did learn that an admin can delete herself from a blog, so I was able to delete myself instead of asking her to go in and delete me after we were done troubleshooting. That problem is a good case in point, though. The student needed timely intervention and expert help to solve the problem, and she was understandably stressed about it. If she had had to wait a long time and/or if we had not found a solution to her problem, that would have been a really negative experience for her, and I would have felt very badly about it too. Luckily for me, though, I can usually provide tech support in a timely and reliable way. Timely. Since I teach fully online and only online, I'm available M-F to help students in a very timely way. I don't provide that kind of support on evenings/weekends, but the students know that they can get pretty much instant access to me during the regular work week for any question they have, no matter how random, and for serious problems of course I'm willing to work with students on evenings and weekends too... but that almost never happens. Reliable. I try to make sure that I have personal experience and at least some technical expertise in the tools that I recommend or require students to use for these classes. And I will confess that I actually enjoy troubleshooting a problem because it allows me to extend that experience and expertise, which will thus allow me to do an even better job in the future. Some faculty might expect to the IT Helpline to provide all the tech support for their students, but that seems to me like expecting the Writing Center to provide all the writing instruction. There are some things that we just need to do as faculty members using technology for academic/professional purposes, and one of those things (I believe) is to help our students learn to use technology for academic/professional purposes too. It's obviously at the beginning of the semester when students require extra support, so I anticipate spending that extra time at the beginning of the semester. And at least so far, it really hasn't been bad at all. Plus, it's good for the brain! Critical thinking, problem solving, and communication skills: you need ALL of them to troubleshoot a computer problem. Meanwhile, about this analogy between tech support and writing support, I actually have more to say, but I'll save that for tomorrow. Given that so many students had created their blogs already during the "soft start" week of the class last week, I wasn't too worried... but still, what a great relief that the new Blogger blog approach seems to be working just great! There are now 60 blogs up and running (out of appx. 90), and no problems at all along the way. A couple of people were not clear on the difference between blogs and blog posts (so they tried to create a new blog for each new post), but we got that straightened out pretty easily, and I revised the instructions accordingly. Best of all: people seem really excited about blogging with a real blogging tool like this. Most of them are completely new to blogging (a few tumblr users, a few WordPress, but overall: blogging is new! ), and I am really glad about how the first post about "Favorite Places" was something fun and easy to write, while also introducing them to one of the most powerful things about blogging: combining text and images. That particular assignment — create a blog, and then create a Favorite Place(s) blog post — has a due date of Tuesday, so I should get the rest of those in tomorrow. I'm very pleased at how many people took care of all that already on Monday (or earlier). So, tomorrow they will be adding more of these Favorite Places posts, and then on Wednesday will come the storytelling posts! There are already about a couple dozen of those storytelling posts also, using all three of the options - fable, nursery rhyme, map. So far it looks like the nursery rhyme is the popular choice, which is just great: that was something new this semester too! Anyway, long day — we'll see what tomorrow brings, and I am excited that it will start off with me commenting on as many of these wonderful blog posts as I can find time for! Whoo-hoo! I had such a success with the Course Redesign Diary this summer that I am going to try to do something similar for the Fall semester, even if it is just a quick post or an embed of a Google+ post each day. Today is Sunday, August 17... the day before the official first start of classes. I've made so many changes to the classes this semester (some of them HUGE), so I will have plenty to write about here in my diary, but I wanted to start with something simple and powerful: the dedicated class Twitter stream. I've pasted it in below as a widget, and there is also a widget in the Class Announcements sidebar. I'm been amazed at how incredibly easy it has been to integrate posting to this Twitter account a natural part of my day, with multiple items every day that just present themselves — either from my OU Twitter lists and/or my web browsing and/or class content creation. There have even been some tweets for student content creation, and I hope there will be more and more of these. So, I guess all my time spent FINALLY learning how to make good use of Twitter has paid off. 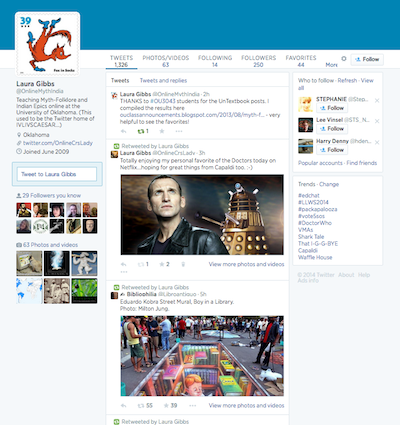 I am hoping this Twitter stream will be both fun and useful for the students. Obviously, it could have the best impact on students who already use Twitter, but thanks to the widget in the Class Announcements sidebar and my links to the Twitter stream in the announcements, it will be fun and useful to ALL the students in these classes! Blogger, Inoreader, Feedly: what a great way to start the semester!!! As people who know me over at G+ or Twitter saw this week, INOREADER was the big event! I am in love with this tool! 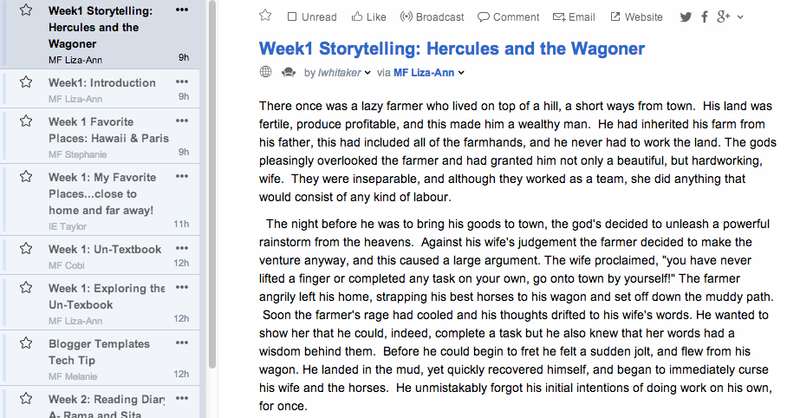 Blogging in my classes: Bloglines and Ning. I've been teaching fully online classes since 2002, and I abandoned discussion boards for blogs in my classes so long ago that I cannot even remember when that happened. Maybe in 2004? There are lots of reasons why I far prefer blogs to discussion boards, and I guess I should write up those thoughts sometime. Meanwhile, though, suffice to say that blogs are essential for my classes. Students write several posts every week, and they also read and comment on each other's posts, just as they read and comment on each other's class projects. This reading and commenting is the heart of the class! 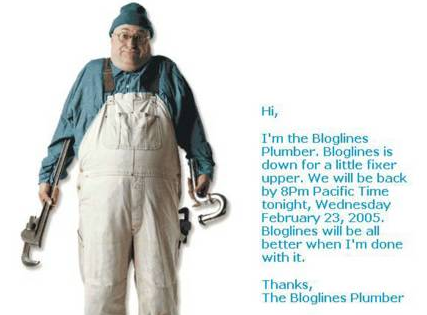 So, way back when, I recommended that the students use Bloglines, which was primarily an RSS reader but it had a very simple blogging tool too... and people probably remember the hilarious Bloglines Plumber for when the system was down. That service then pooped out, but I gladly switched to Ning; that must have been in 2008. I enjoyed free Ning for a couple of years (wasn't free Ning amazing? ), and then I switched to the mini-Ning (primarily for educators), which was just $20/year. Ning worked very nicely as a group blogging platform, and it really ran itself. 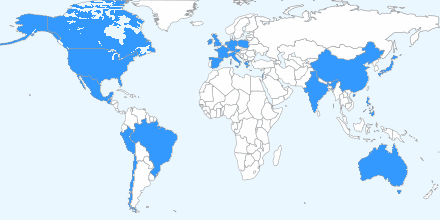 Since the students were all blogging in the same place, with a nice homepage display of recent activity, it was very easy for them to find one another, connect, comment. I really pretty much just let the Ning run itself, and it worked just fine. Not perfect (the group space meant students could not customize their blogs, and it had only limited RSS), but since the students were able to find each other, read, share, and enjoy, I was perfectly happy with how Ning was working. End of Ning. Thanks to a remark by Michelle Pacansky-Brock (I am pretty sure it was Michelle; I learn about so much stuff from her), I found out that mini-Nings were going to be phased out sometime during the 2014-2015 school year. I was sad to hear that, but not surprised. It was clear that other services, like Edmodo, had come to occupy the education niche that Ning had at one time aspired to. I had no interest in paying for the very expensive (I think it's $25/month?) standard Ning since none of the standard Ning features really pertain to my class (they are very much about video, monetization, etc. ); I just needed a good way for students to blog and interact via their blogs. But what blogging tool should I recommend? Argh! Crisis! But a productive one, since I knew there were lots of options out there, and I had plenty of time to ponder as I had learned about the coming demise of Ning back in December 2013. Feedly Dilemma. So, I spent time this summer thinking about how I would make this huge transition from Ning to Blogger. Luckily, I had for years been recommending that students create their own Blogger blogs as an extra-credit "Tech Tip," so I had lots of good support materials already written up. I was a little nervous just because I am always nervous about doing something new for the classes, but with all my Blogger experience, I figured it would work out. And it did — I opened the classes early, students instantly started created their blogs and posting, and I subscribed with Feedly since that is the feed reader I've been using since the sad demise of Google Reader. I had been a real power user of Google Reader back in the day, and Feedly seemed like a pretty poor replacement, but it had been good enough for my purposes ... until now. Since Ning had provided a group blogging platform with a shared activity stream for all the blogs together, I really wanted something like that again. But Feedly has no bundles, no public pages, no aggregated RSS... it had nothing to offer me here. Bummer!!! So I posted a plea for help at Google+ and ... THANK GOODNESS ... Stefan Heßbrüggen commented that Inoreader would do just what I wanted in terms of RSS and HTML clippings. I was so busy last week that I didn't think I would have time to check it out until the weekend, but at the same time I was so curious that I decided to check it out that same evening. Inoreader. I was able to log on to Inoreader with my G+ account. And there it was: so blank, so empty... and so configurable!!! This was definitely the right tool for someone who didn't just want an "out of the box" solution but who instead wanted to configure their own RSS world. I quickly subscribed to the student blogs (I'll have about 90 total each semester, but right now it's just about 20 blogs, divided between two classes; these are the students who got an early start), and it took me just a few minutes to see that I could activate an RSS feed for the folders I create for each class. Fabulous!!! 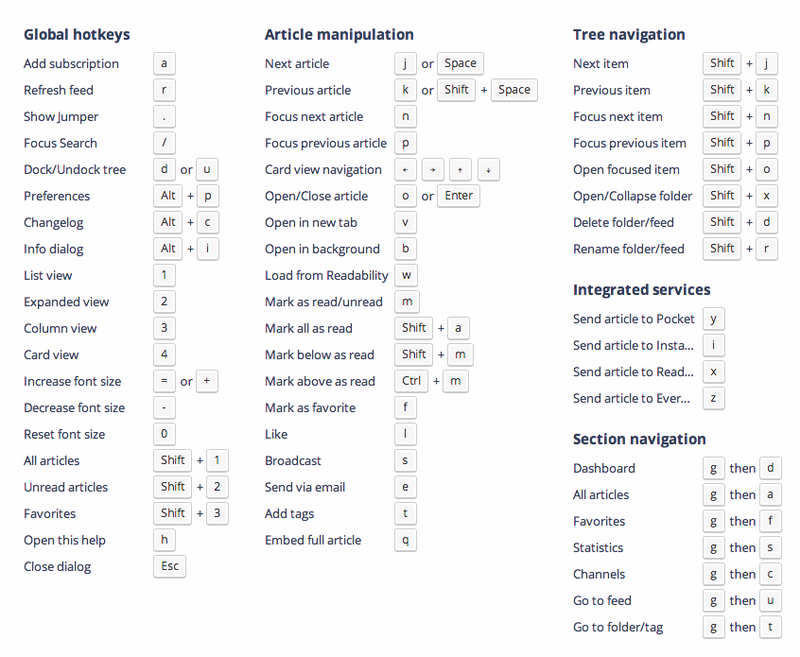 And then I saw I could have HTML clippings, just like in Google Reader, for those grouped feeds. Perfect! So, I was already sold at that very moment: this was going to be as good as Google Reader. But then I noticed something that really caught my attention: from the URL of the HTML clippings, I could see that the folder labels were really just tags... so did that mean I could make RSS feeds and have HTML clippings for ANY tags that I created? Oh my gosh: how amazing would that be? So I tagged some posts and, sure enough, it worked: I could activate an RSS feed and have HTML clippings for tags. And then I discovered the rule-maker! Now, with free Inoreader, they only let you make one rule (more than one rule is premium)... I made my rule, gasped at how perfect this was, and instantly upgraded to the premium service ($30/year). Inoreader as Shared Space. 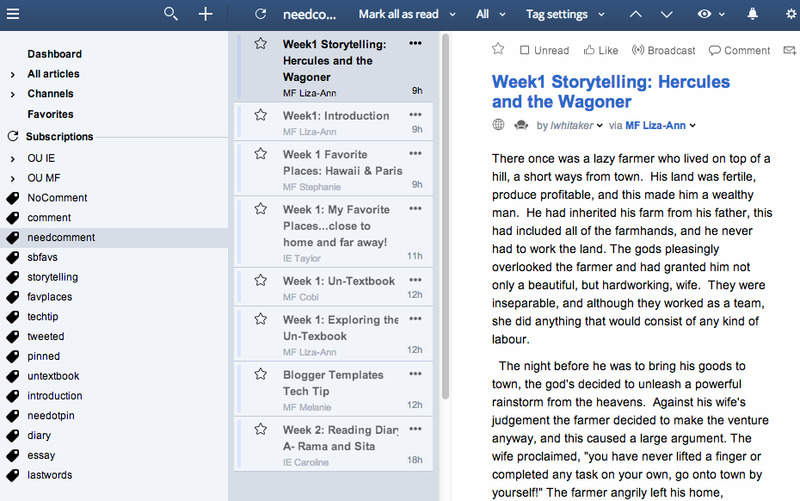 And don't forget, all that workflow stuff is just a bonus — my original goal was to find a feed reader to help promote a sense of shared space for my students, and Inoreader is doing exactly what I had hoped. For example, thanks to the RSS feed for the posts labeled "storytelling" (the most important posts! 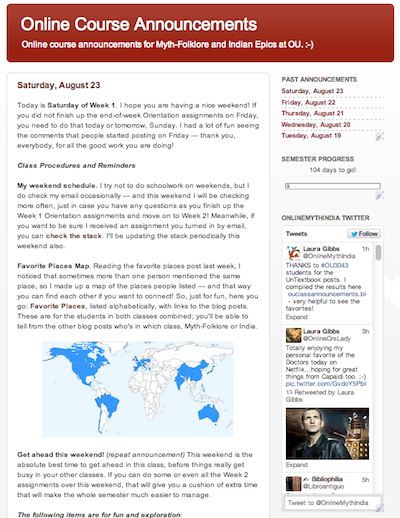 ), I was able to add an RSS widget to the class announcements blog that lists the latest stories as they are published. More importantly, I am able to provide a link to the dynamic HTML clippings in assignment instructions so that students can see work by other students (some folks are always working ahead! ), which can be a great source of inspiration; for many students, seeing actual examples of assignments is way more valuable than step by step instructions. So, take a look at the Favorite Places blog post instructions here; originally, I had only my post to look at as a sample, but now there is a link that allows students to see all the latest posts at that time. So cool! They came automatically into Feedly in separate folders because of the way the OPML file in Inoreader is structured, but I think I will probably just put them in one gigantic folder in Feedly since there is really no point in having separate class-by-class folders for the comment traffic, although I am still pondering that. Very VERY happy. So, as I sit here just 72 hours or so after discovering Inoreader, I cannot believe how lucky I am. If I had been given the chance to design a blog management system for my classes, I could not imagine something better than this! I am now going to be a much more active and aware participant in my class "blogosphere" than I ever was before. 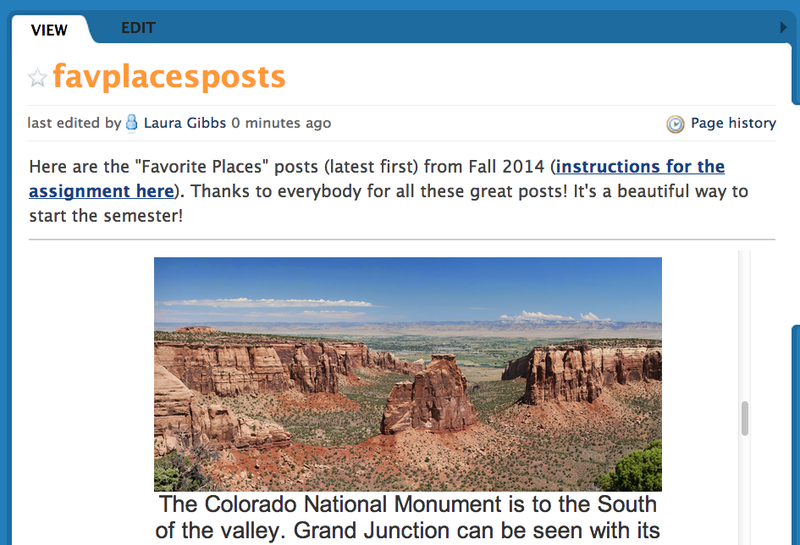 Plus, students are really loving Blogger so far exactly because of all the customization and personalization options. They have a much stronger sense than they ever did in Ning that the blog is THEIR blog... and that is indeed how they should feel because it is their blog! That sense of pride and ownership is exactly why I abandoned discussion boards long ago: a discussion board belongs to everybody/nobody, but a blog belongs to SOMEBODY, and it thus becomes a way for that person to build their online presence, sharing with others and getting to really be themselves online. Now, if my school really embraces Domain of One's Own and finally starts providing blogging support for classes (wouldn't that be great??? ), this system should continue to work just fine. My experience with WordPress is limited, but exactly as I told the students to begin with: ANY blog they want to use will work, provided it has RSS for posts and RSS for comments, which would surely be true for any WordPress set-up which my school is offering (I am hoping they will allow me to join the pilot so that I can investigate questions like these early on). 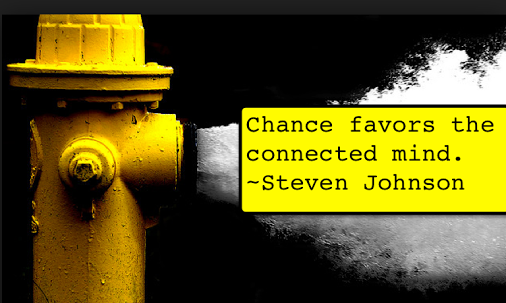 Saturday morning, start of the semester, and I am simply amazed at my good luck ... but chance really DOES favor the connected mind, doesn't it? Thanks to Inoreader (which means thanks to Stefan! ), I am completely caught up on commenting on student blog posts after the soft-start week, and, even better, I have customized HTML clippings to share with the students, plus there are surely more RSS possibilities that I have not even imagined yet ... because really, this is all just within 72 hours of finding Inoreader: I know there are other amazing features I probably have not even discovered. It was always a hope of mine that I could extend/improve my own participation in the class blogosphere, and now I should be able to do that, even with the very limited time I have available. And the blogs just look SO GREAT. I love the way that they create a real space for every student and a real presence for them online. I cannot imagine teaching without student blogs, and now with my new trio of Blogger-Inoreader-Feedly, I think I am going to do an excellent job of helping students as their blog coach and cheerleader! What a great way to start the semester!!! Thank you, Inoreader!!! Okay, this is getting VERY exciting! All the huge changes to my classes this summer have been triggered by one simple event: no more mini-Ning. Since I have been using the mini-Ning as my "online class space" for the past five years, that meant I needed to find new ways for my students to blog and interact with each other as they had been doing at the Ning. It was easy to choose Blogger as the best option (given that Blogger is a part of my daily online life), and so now I have begun the big task of rewriting my Orientation assignments to take this change into account. Instead of focusing on the Ning in the first week, I need to focus on Blogger, and the very first day of class is about getting a Blogger.com blog up and running, and then adding a post there. Luckily that is easy to do (Blogger is so simple to use!)... 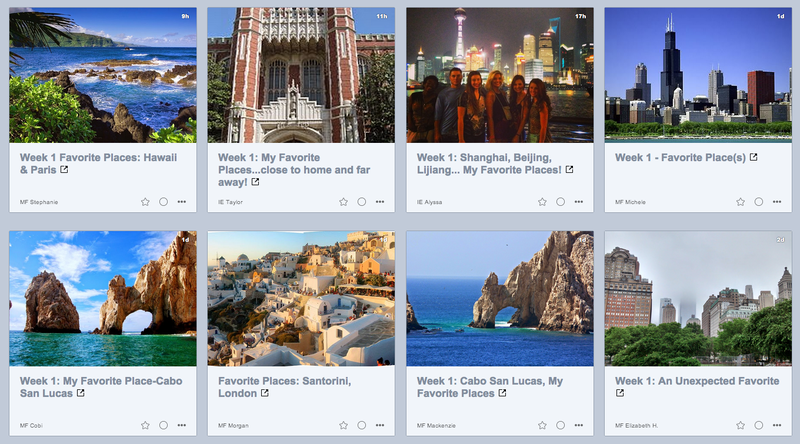 and in order to get off to the right start with how students work with images, I decided to make the first blog post an image post: Favorite Places. So, I've written up the Getting Started with Blogger assignment AND the Favorite Places blog post assignment, which meant I created a sample blog post myself: Week 1: Tucson, Cracow, Berkeley... My Favorite Places. which turned out to be an image contributed to Flickr by none other than Alan Levine... SMALL WORLD. 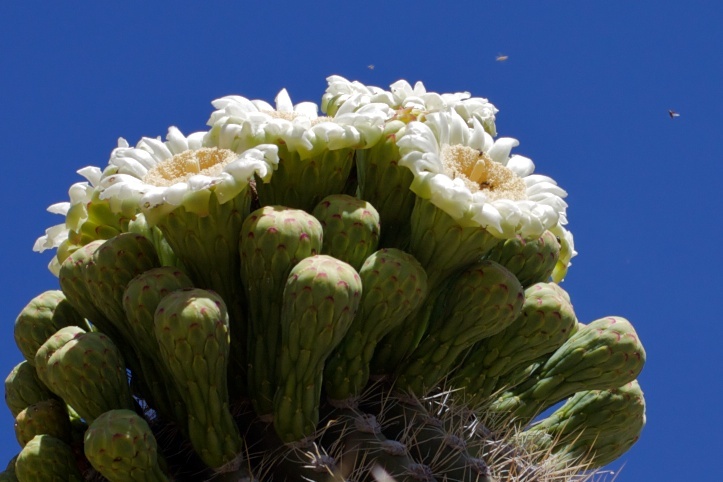 So, there's another OER re-use story for you, Alan: in addition to all the many things I have to thank you for, I can also thank you for the lovely saguaro flower! Anyway, I am really happy about this assignment. Students will do an Introduction post later in the week, but by focusing just on the use of image(s) in this very first post, that will let me make sure they are feeling confident about working with images, while also letting me get to know something about them (and to get to know something about me too via my post for the assignment). I am soooooooo curious to see what places show up in their blog posts!!! So, I thought I would share this little D2L trick that I use for keeping track of students during the churn of add/drop enrollment. D2L's Roster has an "Enrollment Statistics" view that shows you the students who have withdrawn more recently, but it does not show you the students who have added! So, that's a problem: I need to know who has added the class recently because I keep a separate roster — and I keep a separate roster because D2L doesn't actually have the data I need about students, so I have to run the roster in Google Docs; that's where I record the link to their blog address, their website address, student athletes plus athletic advisor email, all kinds of other info I need... and since I have to synch that class list manually with the actual enrollment in D2L, I need to know both who dropped AND who added the class. 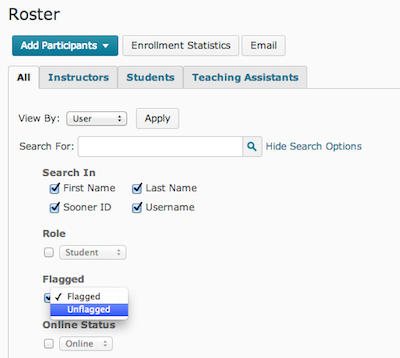 Here's the trick: when I add a student to my roster, I FLAG them in the D2L roster (there's a flag in the roster that turns on and off just like the flag feature in the Gradebook; I use the flag feature in the Gradebook a lot too). This works because the flags are persistent in the roster view, and you can search by flag / not flagged. That means I can search the D2L roster for "NOT FLAGGED" in order to see who has added the class recently so that I can be sure to add them to my list. After I add them to my Google Doc list, then I flag them in the D2L Roster. Then I check the "enrollment statistics" for most recent withdrawals to see if I need to remove anybody from my list. Presto: the lists are synched, and it just takes less than a minute each time. It bugs me that the D2L Roster and Gradebook are not like real spreadsheets where I can create my own columns, build my own filters, formulas, etc. inside the sheet, but at least this little trick helps me synch up the class list with the Google Doc spreadsheet without any trouble at all. So, I went to check the university Bookstore for my book order... and: total screw-up. There is only the optional book listed; none of the three required books are listed. The order was placed back in April, and I've only been teaching the same class with the same books every semester for the past 12 years. Criminy. Update: The super-nice people in my College's administrative offices got with the Bookstore first thing on Monday morning to get this fixed up. It turns out there was another online course that had a similar problem, so they were able to get both problems taken care of. I feel very lucky to have their help with stuff like this! On the one hand, I am glad for the initiatives my school has pursued to lower book costs (like the rent-used option)... but it bothers me that the Bookstore will only accept one ISBN per book so that there is no easy way to let students know that there are older editions, perfectly acceptable, with different ISBN numbers. So, I make sure students know that any old edition of the book is GREAT, no problem, and I include links to the old editions at Amazon so they can see the incredibly cheap used books there and/or use the ISBN numbers to do other online shopping at other book vendors. That's information the Bookstore should want from me, too, but their sales model doesn't facilitate students buying used out-of-print editions from other vendors online. Anyway, I am very pleased that the three books for class can be purchased used from Amazon for under $20 total, and that includes shipping! That is very cool. Three cheers for used books and used booksellers!﻿!! Wow, I had not anticipated how many great opportunities I was going to have by totally redesigning my classes. There were so many little things I've wanted to do for a long time, but I could do them a little at a time; it's a whole huge set of changes that needed to happen together... and it feels so good! In terms of the actual class activities — reading, writing, sharing — nothing has changed... but the organizational aspects of the class are so much better, and I hope the students will find it more fun and easier to manage, while still learning a lot. About one of the changes, though, I am ambivalent, and I want to write about that today. Last semester I tried to document in great detail just how students were managing their time, based on the indirect evidence available to me. When I first designed my classes way back in 2002, I did that on the optimistic (and very wrong) assumption that students would be ready and eager to create and manage their own schedules! I figured that I would decide on the week-to-week schedule (just to make sure students were making progress over the course of the semester), but that the students could, more or less, decide for themselves how to manage their daily schedules, with just a minimum of daily deadlines from me (deadlines that I had to impose in order to make the student-to-student interaction parts of the class function)... and I especially hoped that they would choose to work a week or more ahead in order to give themselves total freedom in devising that daily schedule. After all, it makes sense: if a student devises her own schedule, based on the constraints in her life, of course that would be better than a rigid and arbitrary schedule imposed by the teacher... right? How could it be otherwise? Alas, I was so wrong. It was not just that students were a little surprised and confused by being asked to create their own schedule for the week's work; some of them apparently just couldn't do it. Instead, they took the few daily deadlines I had set, and used those as their ONLY deadlines, and so they did their work in unwieldy bursts of activity which were stressful for them and did not lead to good work either. Last semester, I had really run out of new strategies, so instead I spent the semester documenting my anecdotal impression by keeping a careful count of student time management successes (working ahead) and troubles (falling behind) week by week. The numbers confirmed my anecdotal impression: some students fell behind despite my best efforts, and almost no students were working ahead; the large majority of students were simply depending entirely on me to set the schedule for their work in the class. So, I've given up. Yes, I am conceding to the larger culture of teacher-control/student-passivity which rules my school, and I have created a more granular work flow with more deadlines from me. And I'm very ambivalent about that. On the one hand, I am thrilled to be able to help my struggling students this way, and I know it will help; by having me pace the work for them, the students will have less stress and will learn more. So that's great. And the few students who do work ahead will be unaffected by this; anyone who WANTS to set their own schedule can totally do that, and more power to them. But I now know that very few students will do that and, in a sense, I have become part of the problem, reinforcing the pattern of teacher-control rather than student-control which I would far prefer to see. How depressing is that? * Monday assignment deadline. Before, I figured people would actually start their week over the weekend, or maybe on Monday, based on what was most convenient for them, and the first deadlines came on Tuesday. Well, almost all the students simply waited until Tuesday to start the week. Not good. So now, for the first time ever, I have pulled off the first task to be completed in each of the classes and made that due on Monday. Which means most students will indeed start their week on Monday instead of waiting until Tuesday. I have to confess, though, it feels so wrong to have Monday deadlines. That is something I told myself I would never do (so... never say never!). * Reading and writing separated. In the previous incarnations of these classes, I had let the reading and writing assignments stand side by side, letting students decide what kind of approach to the writing they preferred: writing their own story right away while the reading was fresh in their mind, or waiting a day to let it percolate and sink in. 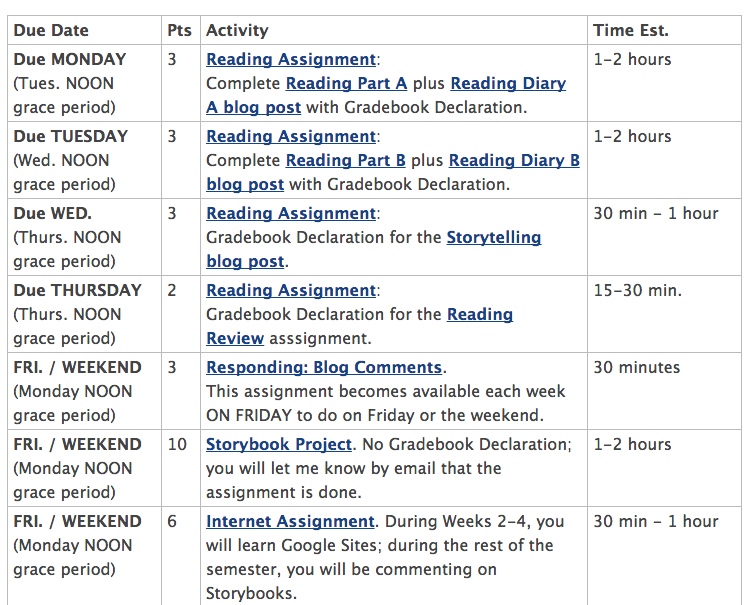 This meant that the final reading assignment for the week was due on Thursday, as was the storytelling assignment. Now, however, I have radically changed the way that works: the reading assignments are compressed into the first half of the week (Monday and Tuesday), with the writing assignment on Wednesday. * Review on Thursday. I also optimistically assumed that students would want to manage their own weekly review, looking back on the past week and preparing for the next week. That's a necessity, right? For a semester to be coherent, you need to constantly be reviewing, right? Unfortunately, no. Instead, the larger school culture promotes a relentless forward movement from one assignment to the next, with no looking back. That might make sense in terms of checking assignments off just to get things over and done with, but it is surely not good for learning. So now I have an explicit review assignment on Thursday. 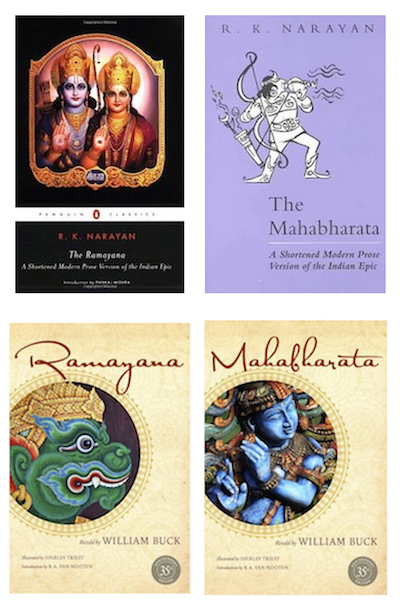 This was inspired by my use of a midweek review in Indian Epics last year that was super successful, and that class also had very successful review weeks in Week 8 and Week 15. 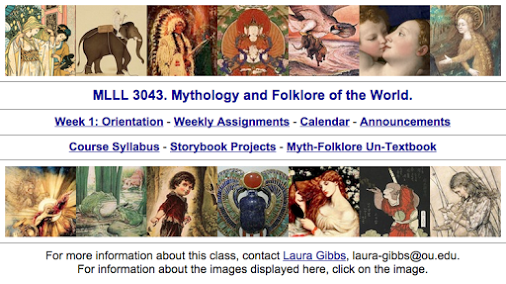 So, in both classes now there is a review assignment on Thursday (which is also a great feedback assignment for me, too, which is exciting), and I have added in review weeks to the Myth-Folklore class in Weeks 8 and 15, just like in Indian Epics. So, on the one hand, I am really glad about these design changes. They will make for a better class experience for all the students, and especially for the students who struggle with time management (and that really is the only serious obstacle students face in my classes: TIME and the stress that comes from not having enough time). I will also be getting better feedback, both direct and indirect, from this more granular schedule. Yes, big data, ha ha. Not that Desire2Learn helps me track any of this data... but I have my own data-tracking to support my reminder emails to the students (all of which I rewrote this morning to fit the new schedule). On the other hand, I wish I did not have to do this and that, instead, students would want the freedom to set their own schedules. By creating this more granular schedule, I have given in to the forces that insist I am "in charge" of the class and that student learning is something to be "managed" (even if our learning management system is of not help to me at all in this process, ha ha). So... I am very curious to see how this will go! It will take me a while to retrain myself to get into the new work flow this semester (especially Monday deadlines, blech), but the daily reminders will help me to do that, and I bet by the third or fourth week of the semester, I won't even remember that it used to be organized any other way. And I am hoping for good things to result from the re-organization! Course Redesign Update: August 1... no going back now! Now the real course RE-design phase begins... and it has to happen fast: I've just got until August 11 to get this all squared away! Eeeeek! Doing the new content was easy because content is objective, static, easy to control... but the actual course itself, the work the students do, the way they interact — that is hard! But I've been thinking and thinking all summer, and I'm ready to do all kinds of new things. Plus, there's no going back now: I changed my course websites! 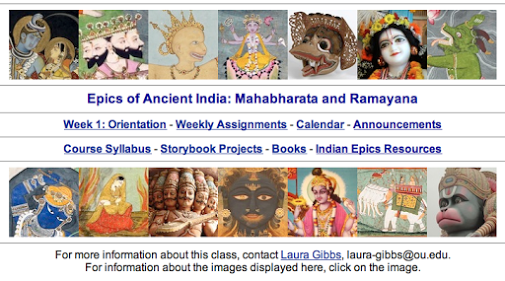 Screenshots of the new homepages below: Myth-Folklore and Indian Epics. The layout of these new homepages is basically the same as before, but the difference is that the links all point to blogs and wikis; the old websites are no more! I left the pages up to avoid link rot in case anybody had linked to the old sites... but in terms of my actual classes, it's all somewhere else now. And, I am glad to say, all built with tools like blogs and wikis that make it so quick and easy to update everything quickly so that I can keep on expanding and improving all the time!